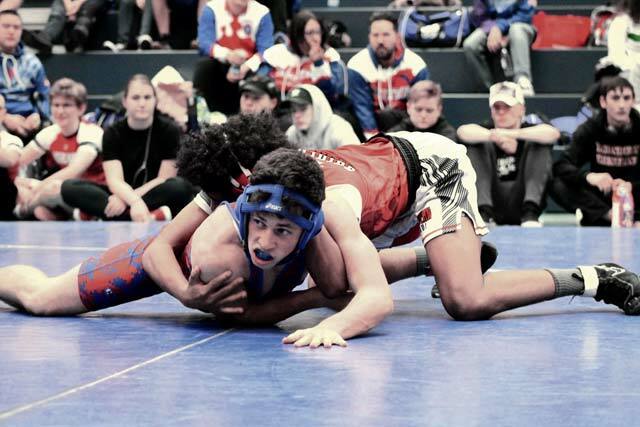 Ramstein superior depth and experience was too much to overcome for five opponents as the Royals overpowered five opponents to claim the team title at its home wrestling tournament Saturday. The Royals scored 249.5 points. Runners-up Wiesbaden picked up 168.5, Kaiserslautern had 114.50, followed by Spangdahlem, Lakenheath, Alconbury and Baumholder. Through talent and sheer numbers, the Royals scored points in almost every event with five first place finishes, four seconds, five thirds and four fourths. The meet had a two-way system of scoring. Some of the weight classes carried the bracket format while others competed round robin, each of the wrestlers going against everyone in a given weight classification. The Royals’ Connor Mackie was one of the outstanding performers at the meet. 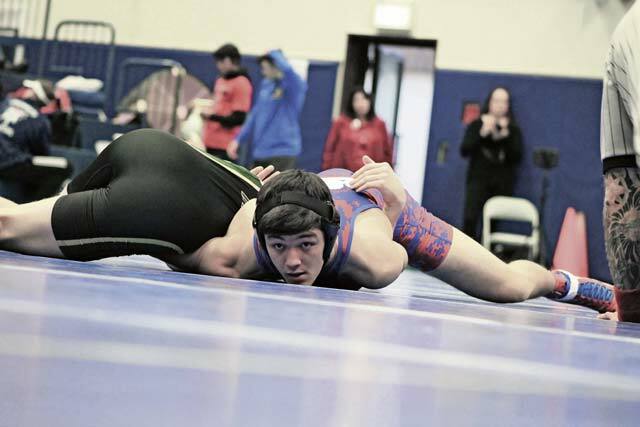 He decisioned reigning European Department of Defense Education Activity All Europe Abreyu Allen of Wiesbaden 5-0 in the final match at 126 pounds. He won his first bout 12-0 and recorded falls in his next two before winning the final match. At 132, Royals teammates Brian McKinley and Christian Griffith scrapped in the finals with Griffith taking the title. They were very familiar with each other after battling daily in practice. Griffith won on a technical fall 18-3. Logan Campbell was victorious over Wiesbaden’s Jack Rohling at 138 pounds with a quick pin at 1:36. One of the most entertaining and strongly contested matches of the day was at 152 pounds, where Ramstein’s Oliver Seelig edged Jay Brown of Kaiserslautern 19-14. Seelig needed two late points to put it away. Gabe Davis needed just 42 seconds to defeat Lakenheath’s Nick Scifo at 182 pounds. Davis pinned his semifinal opponent in 52 seconds to advance. Kaiserslautern’s Christian Forker picked up the Raiders’ lone victory with a 13-7 decision over Ray Castro of Wiesbaden at 160. Forker won his first match on points, then pinned the next three for the victory. The gutsiest victory of the day belonged to Brian Haney of Spangdalhem at 145 pounds. Mixing it up with Ramstein’s Tayler Worley, the paramedics were called in as Haney yelled in obvious pain. But he rebounded and got the technical fall for the title. In the round robin 106 pound class, Ram­­stein’s John Odom do­mi­nat­ed with 18-2 and 16-1 technical falls and a pin against Lukas Ahrend of Kaiserslautern. In the battle of the large, Jackson Fontenot of Wiesbaden defeated Ramstein’s Carl Wilcox with a quick fall at 285 pounds. Kaiserslautern’s 113-pounder Skye Flannigan scored a major decision over Faith Fairel before falling to outstanding Ramstein senior Andres Hart, sending her to the lower bracket. She rebounded with a convincing pin of Ray Woodard of Lakenheath before falling in the third-place match to Wiesbaden’s Reyder Rivera. The Raiders Napolean Cox pinned Ramstein’s Aidan Stcyr in the third-place match at 138 pounds. Kaiserslautern’s Andrew Wells was third at 170 pounds. Baumholder brought seven wrestlers to the match, one junior, two sophomores and four freshmen. The Buccaneers tallied ten points, mostly coming in the round robin portion of the event. However, first-year head coach Matthew Martinez refused to use school size as an excuse for the lack of points. “They all weigh the same,” he said, referring to wrestlers going against athletes in the same weight class as them. “We are young and inexperienced. But we work hard every practice and spend two days a week in the weight room to get stronger. We look at how they do week to week and are seeing some good improvement.” He added that if they all stay in the program, with a few more recruits and some more experience and the added physical maturity, the Buccaneers will be stronger in the next few years. One of the most hotly contested bouts was a rematch at 220 pounds between Ramstein’s Theodore Ward and Wiesbaden’s Devin Holland. They met in the first match early in the day with Ward squeeking out a 5-2 decision. In the final matchup, the two extremely strong human beings looked like two bull elks in battle, each trying to assert his will. It remained scoreless for several minutes as neither could establish an advantage, but Ward finally got Holland on his back for the fall. Ramstein, Baumholder and Kaiserslautern will be in Kaiserslautern next weekend for a seven team tournament. The meet includes perennial challenger Ramstein.